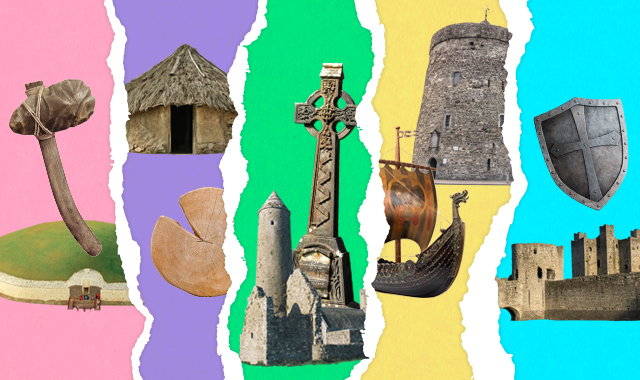 From unimaginable stone age tombs to colossal Norman castles, we look at 5 monuments spanning 5 epic eras. Age is not just a number when you’re talking about something older than the Pyramids of Giza. Introducing Newgrange, a Neolithic passage tomb in Meath that boasts some seriously impressive engineering. On the winter solstice, the rising sun shines through a special opening to illuminate the ornate inner-chamber. Who were these Stone Age pioneers? We’ll never know, but many say the mound was a tribute to the gods. If so, then it’s some tribute. Flash forward to the Celtic Era and the Corlea Trackway, an ancient bog road in Longford. The thick oak planks were only unearthed two decades ago, having remained perfectly preserved beneath the mire for millennia. Like their Neolithic ancestors, the Celts were a devout bunch and seem to have built the path not as a means to cross the bogland… but to stand upon when worshipping the gods. Soon the centuries ushered in the Early Christian Era and stone began to replace wood – it was harder to burn wood, as the monks were quick to realise! Glendalough in Wicklow is strewn with stone ruins, carved crosses and round towers – the secret hiding spot for the monks protecting treasures, such as the Book of Kells, from the newly arrived invaders: The Vikings. The raids by these seafaring Scandinavians continued through the Viking Era and as the years went on, the terrifying invaders became settlers, and the island was left with a legacy that is seen in place names, precious art and monuments. Like Reginald’s Tower in Waterford, which is named after the very Viking who founded Waterford back in 914 AD! Speaking of which, it was the Normans who beat back the Vikings during the Norman Era and are responsible for some of the most incredible strongholds ever built in Ireland, including 12th century Trim Castle. So impressed was Mel Gibson that it became central to the filming of Braveheart. But perhaps the most fitting accolade came from Richard Pococke, the Archdeacon of Dublin and explorer of Ancient Egypt, who described the castle in 1753 as “the greatest piece of Antiquity” he had encountered.